A new nation has joined in the fray! 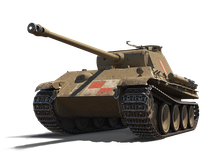 Welcome the Pudel, the first Polish vehicle to join the World of Tanks. "In terms of gameplay, the vehicle presents a copy of Panther I (a Tier VII tank) with a less powerful gun. Decent dynamics and high damage per minute make it perfect for supporting attackers on the second line. Playing in this vehicle allows for an effective earning of credits. In addition, the decent armor (that passed from the Tier VII tank) allows for blocking damage from lower tier vehicles. However it can hardly resist the damage from Tier VI-VIII vehicles." Note: Remaining bonuses will expire if not used completely before 1st December 2017.